This is going to be the start of a very beautiful foodship. So how else would I start a food blog about the reduced aisle apart from by visiting one of Cardiff’s well-established supermarkets and really getting to grips with my topic? Predictably, this is exactly what I proceeded to do of a Wednesday afternoon. Now, anyone who likes a good bargain will I’m sure agree with the sheer excitement that a trip to the reduced aisle can entail – hell I personally get so excited about it that I decided to create a blog about it! And this time was no different. As I “cornered” the aisle (which I must say in this particular establishment was somewhat hard to find) my eyes could do nothing but widen at the sheer amount of reduced stock that was crammed onto the shelving. For me, part of the delight of the supermarket reduced aisle, isn’t what you see immediately, but what you find underneath the inevitable sausage rolls and squashed cream cakes. Beyond the realms of quiche and diced cabbage lies the clandestine single rib-eye steak or the family-sized lasagne. 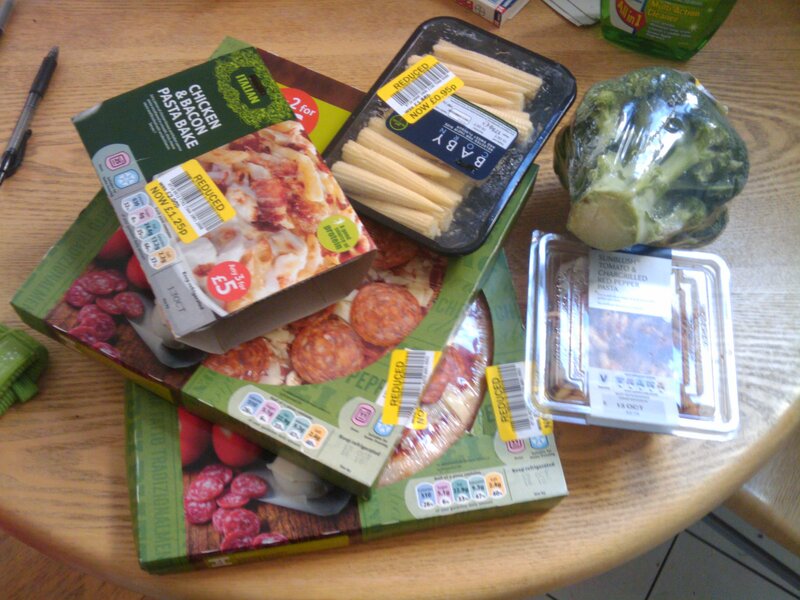 This happy time I left with a packet of babycorn, a pasta bake ready meal, broccoli, a sunblushed tomato pasta salad (from the most quality own brand of the supermarket in question) and 2 pepperoni pizzas. Now, I can tell you that on this shop (where, by the way I bought nothing but things I would normally buy), I spent £7.90 and saved £5.01. Answers on a postcard for what I should make with this little bunch please. I’m starving! Please see photo for what I bought – if it hasn’t worked then it’s because I’m a tool.